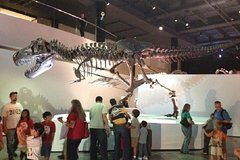 Explore one of the most attended museums in the country at the Houston Museum of Natural Science. Visit North America's largest dinosaur hall, see the beauty of the Lester and Sue Smith Gem Vault and step back in time at the Hall of Ancient Egypt. The museum is regularly voted one of the top attractions in Houston and this is your chance to find out why. The purchase of a Permanent Exhibit Hall Ticket at the Houston Museum of Natural Science will give you access to the permanent exhibits only and excludes special exhibitions and the Brown Hall of Entomology. Your voucher to the museum should be exchanged for your ticket upon arrival. Once you enter, you'll have the option to visit numerous permanent exhibits including North America's largest dinosaur hall and one of the most extensive gem and geode collections in the United States. The museum is perfect for families and school groups, tourist and locals and offers refreshments and food at the cafe.